Oy! Only in Chelm could there be such a problem—and such a solution. 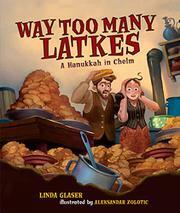 Chelm, that beloved but very foolish village of old-time Eastern European Jewry, has a problem as the first day of Hanukkah approaches. Faigel makes the best latkes (potato pancakes fried in oil). But what is the recipe? She cannot remember. Her husband has the answer—or, rather, he knows whom to consult for the answer: the rabbi, who is the wisest man in the entire town. How many potatoes? All of them, says the rabbi. How many eggs? All of them, says the rabbi. How many onions? All of them, says the rabbi. How many mouths to eat all those mounds of deliciousness? All the villagers, says the rabbi. Glaser’s riff on a holiday tradition is told with lots of dialogue and the necessary understatement so important to Chelm tales. Zolotic’s flat, digitally composed illustrations, based on his background in animation, portray expressively bewildered and hungry white Chelmites with googly eyes and ultimately happy faces.